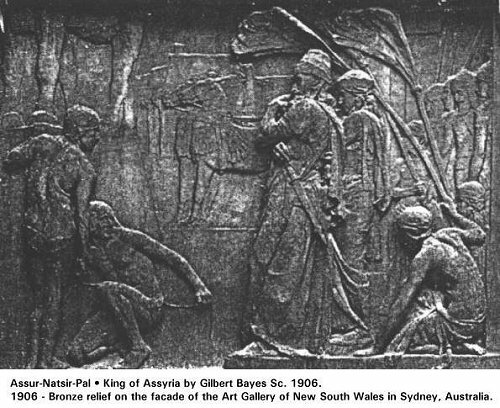 Assyrian panel on facade of the Art Gallery of New South Wales in Sydney, Australia. 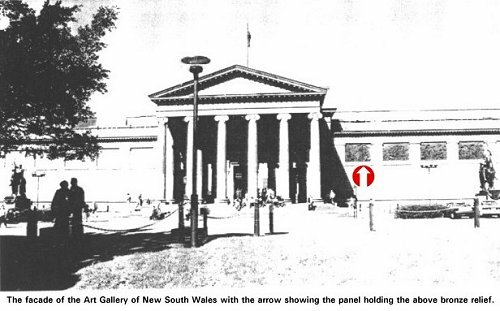 In 1903, the Trustees of the Art Gallery of New South Wales invited sculptors to submit models in a competition for two panels, needed for the facade of the Art Gallery, each ( 11ft. 3in. X 7ft. 6in. ) high and the subjects to be chosen were typical of Assyrian and Egyptian Art to form, together with panels already in place, a complete series of the chief historic phases of Art.